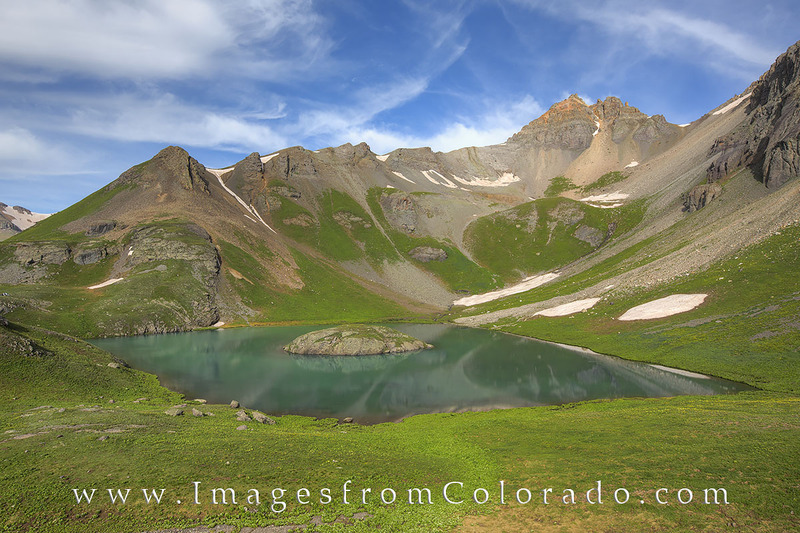 Island Lake is the reward for making the 4.5 mile hike up the Ice Lakes Trail near Silverton, Colorado. This stunning aquamarine turquoise lake is set in a cirque of 13,000’ foot peaks that rise all around, the most prominent being US Grant Peak. The trail takes you past Lower and Upper Ice Lakes, and in the summer wildflowers line the path. You’ll gain around 2,800 vertical feet, much of it in the last push up a steep ridge to gain the entrance into the cirque. Photo © copyright by Rob Greebon.